On Thursday, Grey Goose Entertainment Rising Icon Laura Izibor performed at a private gathering at the Bacardi headquarters in Coral Gables to celebrate the second season of the highly acclaimed BET Grey Goose Rising Icons series. 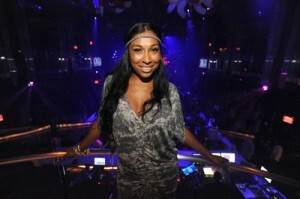 Fellow Rising Icon, Melanie Fiona, performed at LIV on Sunday, where she gave a breathtaking concert. Other guests included DJ Irie, Mike Epps and Louis Oliver. On Friday night, Lebron James threw a surprise birthday dinner party for his girlfriend and mother of his two sons, Savannah Brinson at Red, The Steakhouse restaurant where he brought in a mixlogist to make Atlantico Rum cocktails for his guests which included: Chris Paul, Udonis Haslem, and Brian Hartline of the Miami Dolphins, among others. The specialty cocktail served was named the Atlantico Heat. Apl.de.ap & Will.I.Am hosted the 944 Nightlife Issue release party at LIV. Travis McCoy also performed at the event. Guests spotted included: Alice Panikian (Miss Universe Canada 2006), Cedric Gervais, and Sofia Chapman. Chris Bosh and Adrienne Williams made and appearance, celebrating their engagement which took place just hours before. Miami’s own Market America founders/owners, J.R. and Loren Ridinger recently presented their annual International Convention in Greensboro, N.C. at the Greensboro Coliseum Complex to a sold out crowd of over 25,000. The Ridingers once again enlightened attendees by detailing ways the company is using technology to change the way people shop and unveiling a host of new products and services. Celebrity guest appearances included close friends of the Ridingers, Kim Kardashian and Scottie Pippen. I cant believe how good the Black Eyed Peas’ new song is! The Time is so catchy tho it sampled Jennifer Warnes’ song! I can’t wait til Black Eyed Peas finish their next album soon.